It is natural for you to be wondering what life is like working in the Maintenance department, after all, every company is different. Rather than us tell you what it’s like, instead meet some of our team, who will tell it better than we can. Although my work is very challenging to say the least and my current role is up at the top end of the challenging periods I have experienced, I can honestly say that I have always felt that the company has supported me and provided the right balance with regard to help and encouragement. Yes it’s true to say that there have and will be ups and downs but on balance I enjoy my current role. Please can you describe your career progression? 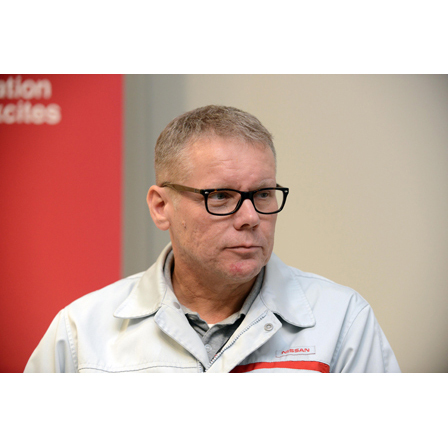 Following a time-served apprenticeship with a tooling manufacturing company in Sheffield, I joined Nissan as a tooling technician where I developed a deeper understanding of tooling applications and maintenance. With 5 years’ experience at Nissan, I had developed sufficient skill and experience to progress to the role of Team Leader. After a couple of years I requested further opportunity for development and Nissan is a good supporter of individual development therefore I was offered a position in the facility maintenance section. This allowed me to develop more skills and experience and also improve my interpersonal and management style. During this period Nissan supported my acquisition of professional Management qualifications through the Open University. These qualifications together with experience helped prepare me for promotion to the next level as Maintenance Supervisor. In the period that followed I was involved in activities that required a good level of overseas work at Nissan plants in Japan and Europe. When Nissan embarked on its Zero Emissions program and NMUK won allocation of a Lithium Ion Battery Plant, it was clear that all of the previous experiences had prepared me for this new and exciting challenge and following the initial launch I was promoted to my current position of Senior Supervisor. I started as trainee so for me it was being part of a major global employer with a solid foundation in the North East. Job security and prospects are high and the training / apprenticeship was recognised as a great place to learn the trade. In just 8 years I moved from trainee to Supervisor. For me, during the apprenticeship I enjoyed the electrical work using PLCs, safety systems and Inverters. Later on I began to get more involved in the management side of the role and got the opportunity to return to university. The best part of the role is seeing trainees and technicians become experienced and skilled in their area, developing into very technical people and future leaders. Team working is the key to any role within the organisation at NMUK. Opportunities are everywhere to move up and laterally. The role they apply for does not have to be their role for life. Apply with an open mind for which area you would like to work in, different candidates will have certain skill sets that can complement different parts of the plant. During your recruitment process, our HR team will provide help and advice with any queries you may have. This extends to the period prior to your start date after you have accepted the offer, as we appreciate that there can be lots of questions during this time. Following your starting with the company, you will receive ongoing support and a dedicated point of contact within your department, along with a comprehensive company induction. It’s important that you feel supported during those early days. It goes without saying that you will be provided with the right training courses to enable you to fulfil your position in the Maintenance department, and your supervisor will also assign you a mentor to act as a dedicated point of contact on an ongoing basis.